Exhausts have become somewhat of a go to area in the last few decades in order to extract additional downforce and so the FIA are always keen to limit the scope available to the designers. The newest set of 2014 regulations are extreme in their application of exhaust positioning in order to reduce it's aerodynamic effects. c) Be located between 200mm and 500mm from the car centre line. The very small yellow zone at the rear of the car however is the area for which the exhaust outlet(s) latter 150mm of tailpipe can be placed in 2014.
c) Be located no more than 250mm from the car centre line. d) Be positioned in order that the entire circumference of the exit of the tailpipe lies between two vertical planes normal to the car centre line and which lie between 30mm and 50mm forward of the rear wheel centre line. 2012/13 - b) Be located between 250mm and 600mm above the reference plane. 2014 - b) Be located between 350mm and 550mm above the reference plane. 5.8.2 Engine exhaust systems may incorporate no more than two exits, both of which must be rearward facing tailpipes, through which all exhaust gases must pass. It seems that the Engine manufacturer's believe otherwise with the re-inclusion of two exits, this of course will have a bearing not only on the Engine's performance but also the utilisation of exhaust gasses to drive aerodynamics. 5.8.3 The total cross-sectional area of the exhaust exits at the rearmost point of the tailpipes must lie between 7500mm2 and 14000mm2. Rather than the regulations current regulations defining 75mm as the maximum outlet size. F1 has become a place synonymous with high noses a trend that all the team pushed to the limits in 2012 and was the result of the 'Step Noses'. 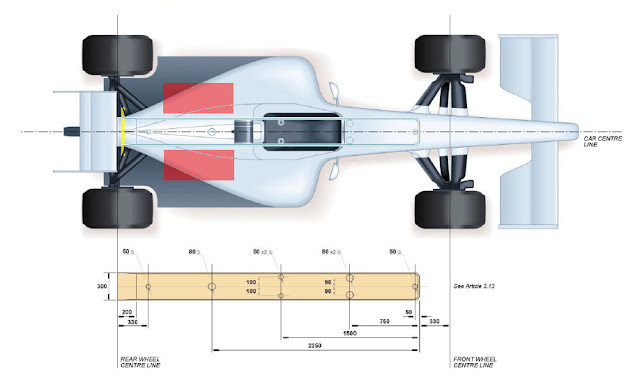 For 2014 the Formula returns to a lower nose with the regulations requiring the cars nose pylons be a maximum height of 135mm, whereas the current regulations permit a maximum height of 200mm. The Front Wing has also been narrowed from 1800mm to 1650mm in an effort to change the aerodynamic influence attained by the element. The footplates width has been narrowed from 60mm to 50mm and is still required to be represented by a continuous piece of bodywork no more than 100mm above the reference plane. The Rear Wings characteristics will be adjusted with the Mainplane's lowest position being raised to 750mm from the current 730mm. Furthermore DRS is currently allowed to move the top flap from a gap of 10mm to 50mm from the mainplane, the 2014 regulations adjust this to between 10mm and 65mm *The change in flap alteration for DRS has been redacted in the most recent version of the regulations. The Beam Wing itself offered a means of structural integrity to the Rear Wing and so we may see a return to the Rear Wing stabilizers inside the 150mm central portion to alleviate this. The loss of the Beam Wing was inevitable with the exhaust exit location directly in line with that area, as the combination of both could have proved a massive downforce coup. On the face of it the changes don't seem monumental but they will inherently change the design aspect of the cars. The lower nose and narrowed front wing will change the design philosophy of the whole car as the designers discover ways in which to turn the airflow presented to and produced by the wheels/tyres. The centralisation of the exhaust(s) limits how the designers can utilise the exhaust to stop tyre squirt impinging on the diffuser. 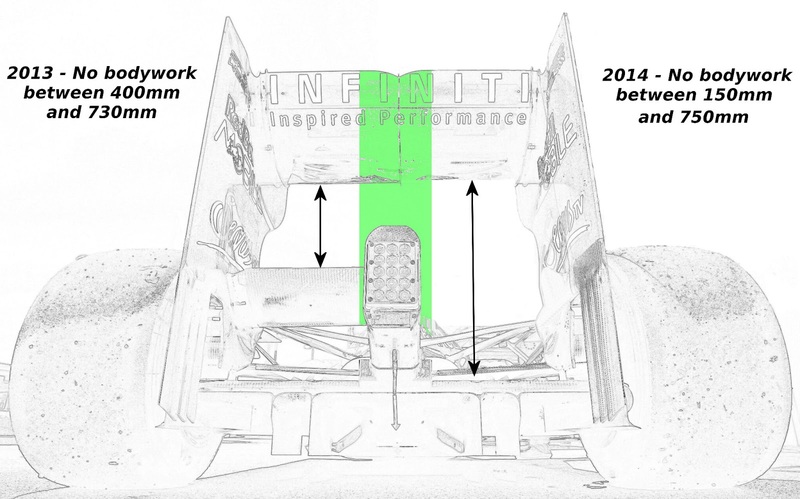 This combined with the net downforce loss of the beam wing will result in a much more rear end happy car. Yes a lot revolution for 2014 and without wishing my life away I cannot wait. A lot of challenges for all team technical departments. Definately, it will be interesting to see who abandons development early into next season in favour of a leap in performance for 2014. Hello, nice article. How do you interpret the new DRS max heigh of 65mm? I think there will be a change in proportions between the lower element and the DRS element because the current one already goes to the lowest drag postion. Thanks for the feedback Ogami, as you say it'll be interesting to see as the drag reduction created is already at its limits. As we have seen this season running with too much creates attachment problems. Theyll likely scale the Mainplane and top flaps differently in order to achieve the same objectives. Fia said that they remain 2012 aero rule for 14.but this is very different to 12 reg.no beam wing,lower noise cone,smaller FW wing. 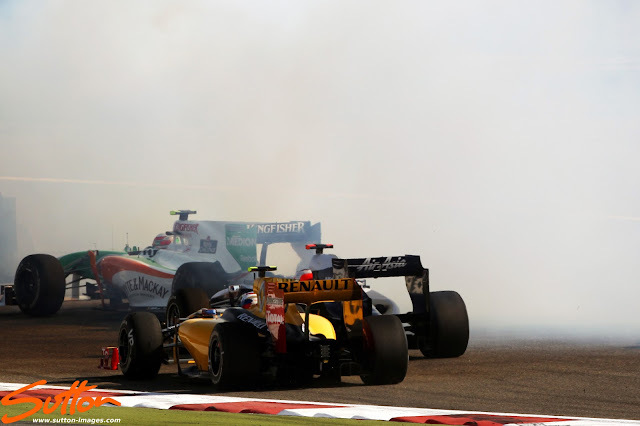 what was planed rule 14 that Fia escape that? I believe what they actually said is they'll remain at 2012 downforce loss targets. The reduction in dowforce in 2012 came from the movement of the exhaust outlets. Turning vanes were banned in the previous draft; But they manage the flows and thus help the wings and diffuser creating downforce; Without them it was simulated that the cars were too slow so they are again allowed. Note that the rule can still be changed till july 31. Brilliant article - am following you on Twitter now to hopefully read more like this. I understand cars will use less fuel from 2014, but that the minimum weight has been increased (for other reasons, presumably relating to new power units).